Sense of Gravity: A Slew of Day Timer inserts fit my Personal size Filofaxes perfectly! A Slew of Day Timer inserts fit my Personal size Filofaxes perfectly! Look at my haul from Day-Timer. I bought seven different inserts! "Inserts, inserts, inserts! ", said my husband, "I've never heard the word 'inserts' so many times in such a short period in my life!" I had a coupon and decided to scratch every itch so I would stop dog-earring and highlighting and writing semi-illegible comments in my Day-Timer catalog. 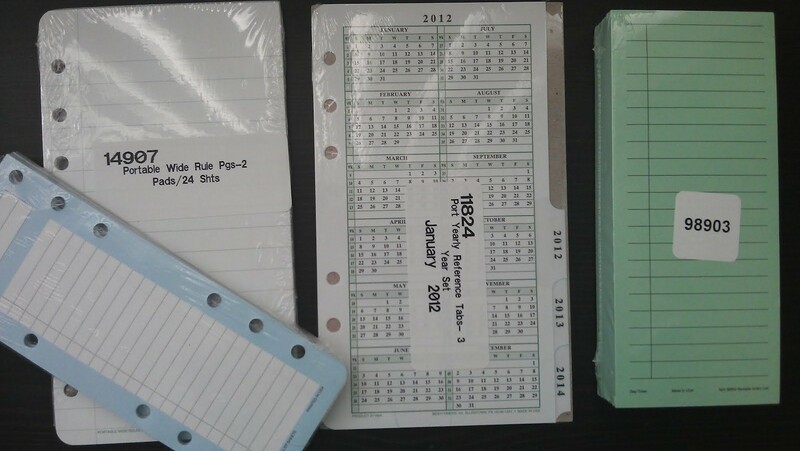 I've only opened the double-punched blue-and-white lists and the scrubs-green stickies. I got the green stickies because they have wider lines than the popular, yellow, sticky pad sold by Day-Timer - those lines are too narrow for me. There are two pads per package. One pad now sits on my kitchen counter and acts as a 'need now!' grocery/sundry list. It supplements the one on my fridge. I've instructed the household to write items on the green list if they need the item asap. I then rip off the list and stick it in my personal Amazona before I leave the house in the morning. I place it on the transparent sheet I keep between my day-on-two-pages sheets. Where did I read that idea? 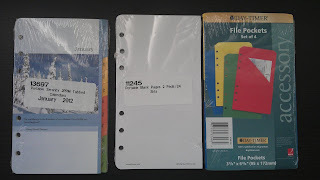 About taking the transparent sheet that comes with each new FF and using it as a page marker? Sorry I can't give credit, but it was a brilliant idea! (Step forward, whoever you are!) I stuck an Avery tab at the top of the transparent sheet and wrote 'TODAY' on it. So much better than the rulers because nothing is obscured. I also made a quick snip from the margin to each hole (no need to cut away any material, just snip it) so I can move the sheet without opening the rings. I just started using the double-punched blue list (again, similar to the popular yellow ones, but with wider lines, and not sticky) today. The double punch is clever, especially if you use week-on-1-page, because you can flip your list to display either on the left or the right side of your FF, depending which edge is attached to the rings. For now - for now - I'm going to keep a running list of small tasks that are not time-sensitive and see how I like it. I think I'll keep it on the page PRIOR to the page I'm on so it doesn't obscure the important matters of the day. Not sure, really, how I'll use these, probably more as a brain dump than anything else. We'll see. More delights, below, which I will open when I'm good-and-ready to savor them. When I can set aside some time to play dress-up with my dollies. Very nice! It's always exciting to receive and play with new goodies. Awesome! I almost ordered goodies with a coupon from DT but held off this time. Why? I have other Filofax goodies on the way! Love the page marker concept as well. Thanks! Thanks for your replies, Lime Tree and Sandra! This: "Inserts, inserts, inserts! ", said my husband, "I've never heard the word 'inserts' so many times in such a short period in my life!" Just got my DayTimer catalog recently. Spent ages flipping back and forth and sticking tape flags on pages with interesting products. Lots more fun than the filofax product line, to be honest! Their (DT) day on two pages setup works brilliantly for me! 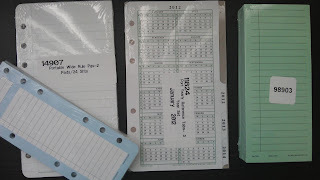 I'm really enjoying the bright, sturdy pockets, the green stickies, and the blue-and-white double-punched extra notes. I use FF DO2P b/c I write big so I really like the extra wide spaces of the to-do sheet. However, the silky smooth, bright white pages of Day Timer are lovely.